June 24, 2011 September 19, 2012 Dan O. Should have just watched Cops instead. Jason Patric and Jennifer Jason Leigh star as undercover narcotics agents who become lovers when they partner up to infiltrate the Texas drug scene and bring down a suspected drug lord (Gregg Allman). But as their relationship intensifies and they become increasingly dependent on each other, they have difficulty resisting the temptations of the world they’re trying to subvert … and soon, their drug use becomes more than just a cover. I wanted to like this, but the writer and director seem more intent on showing drug use and depicting the characters strung out in scene after scene than to tell the actual story: NARCs getting caught up in what they’re trying to stop. I don’t know what happened to me during this film but I just didn’t like it at all. This movie at times comes across as an outrageous PSA or an online criminal justice class with a bad teacher. I don’t know what happened to me during this film but I just didn’t like it at all. The main problem with this film is that nothing really happens here, other than a bunch of drug use and people crying over their addiction. Very little of the film is focused on the actual investigation. They explain what might happen, then skip that scene entirely. The point that’s arrived at in the film is confused at best and stupid at its worst. All of the cops/investigators are weak and ineffectual, while the drug traffickers noble and wise, always one step ahead. There was also no character development at all here and that’s why watching these characters do nothing but drugs and cry about it, started to really bother me. It’s over two hours so you would think that there would be some compelling material here to hold you over, but there’s not really. Just drugs, drugs, crying, and more drugs. Also, this was advertised as a crime action film, where there is only about 2 scenes of actual guns being fired. The one thing about this film that made it suitable was the rockin’ soundtrack that featured many great classic rock artists. The score is done by Eric Clapton, and his slide “Texas” style guitar doesn’t fit well with this film and makes it seem more of a melodrama, but I have to say that a lot of the other songs here were awesome. The performances from these two are good, but their both not really doing much here other than what I mentioned before: drugs and crying. Jason Patric is good as Jim Raynor although we never understand as to why he does all of this stuff that he does to himself. 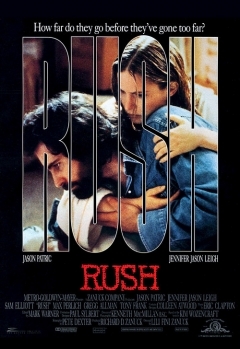 Jennifer Jason Leigh is also good as Kristen Cates and saves the film sometimes from when this film starts to wain on. Gregg Allman is here as the villain Will Gaines, and doesn’t really do much other than be some big hippy in a cool-looking suit. Pretty laughable if you ask me. Sam Elliot is always good and he is a saving grace here. Consensus: Rush is not what it’s title says it is. It’s slow, boring, melodramatic, and features little or no character development for a story that is all about two characters practically crying and fighting over drugs. So, I can look forward to…..drugs and crying. Oh, also crying about drugs. Awesome. It’s too bad, I think Jennifer Jason Leigh is awesome. She is awesome, but here, this is just lame. Totally inaccurate review of a gritty and realistic portrayal of an undercover duo that have trouble staying on the path. The real point of Kim Wozencraft’s book, and also the movie was how these cops, one of whom was a newbie recruit were simply sacrificed in the police department’s less than useless fight for drug busts. It seems you’ve had trouble watching people cry. Would you prefer something more shoot-em-uppy like Die Hard 5 where people don’t change their expressions throughout the movie? If so, I think this genre of adult moviemaking may not be suitable for you.